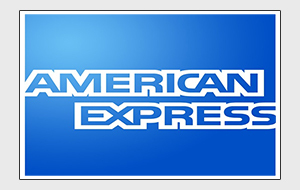 Superior Thread Rolling is heading to the International Fastener Expo in Las Vegas on October 18th – 19th. Stop by Booth #209 to learn about our products and services. Superior Thread Rolling - a leader in thread rolling services, CNC machining and manufacture complete in the aerospace & defense industry recently re-launched our new website. The new website includes custom design that is mobile-responsive and adapts to any device (mobile, tablet, desktop) for the viewer. 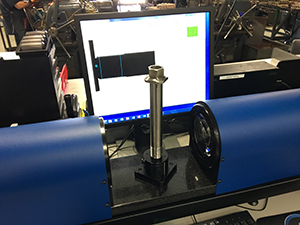 This new visual inspection system by Oasis, allows Superior to check multiple features of a part instantly and records/reports as needed. This bump in efficiency and accuracy helps maintain Superior as the leading thread rolling shop across America. With the mindset of continuous improvement, Superior has utilized the latest form of efficient work holding. 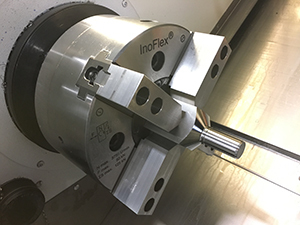 The InoFlex® 4-jaw chuck features an amazing self-centering system which allows two opposing jaws to clamp first, then the opposite two, offering automatic, concentric compensation for square, round, or awkward shaped stock. This will help Superior to improve on their competitiveness in one of their machining work centers. 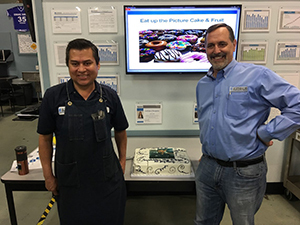 Jorge Solorio, veteran thread roller, celebrates 36 years of service at Superior. His amazing talent and impeccable quality make him an asset to our team. Thank you, Jorge, for all your hard work! Cheers to another 36 more!! The mating nuts that complement the recently awarded A350-900/-1000 pins have been awarded to Superior Thread Rolling. These large mating nuts fit one of Superior’s work centers perfectly and will aid in the future procurement plans of assembly kits for ADI. After many years of Estimating and Planning being separate departments, Superior decides to finally combine the two departments. Led by former Estimating Manager, Pino Tenerelli, who brings over 15 years of machining experience and over five years of Manufacturing Planning experience to the position, strives to continuously improve the department. 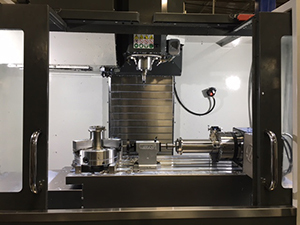 He agrees that this cohesion helps streamline and solidify the up-front process, as well as keep a close eye on and implement technological advancements in machining. Back and time saver!! Machining the ADI pin contract requires machining parts from slugs up to 200mm (7.87”) diameter, weighing approximately 150 pounds per slug! 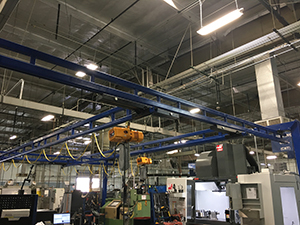 Superior installed a new double-hoist, gantry-type crane system, manufactured by CraneVeyor Corp, over the Large Bolt Cell, allowing the operators to safely and quickly maneuver parts from machine to machine. Each hoist can lift 1,000 pounds, and be simultaneously used in the work center.